The conventional definition of a Bear is someone who expects stocks to decline. For those of us who are bearish on fake fixes, that definition doesn’t apply: we aren’t making guesses about future market gyrations (rip-your-face-off rallies, dizziness-inducing drops, boring melt-ups, etc. ), we’re focused on the impossibility of reforming or fixing a broken economic system. Many observers confuse creative destruction with profoundly structural problems. 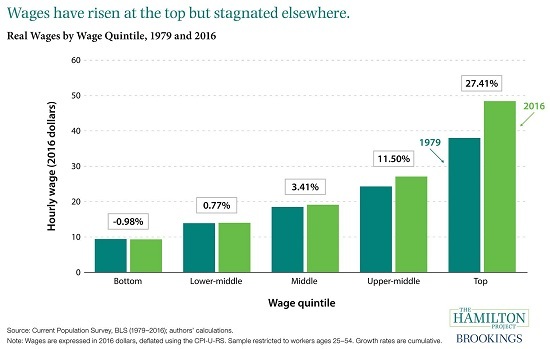 The technocrat perspective views the creative disruption of existing business models by the digital-driven 4th Industrial Revolution as the core cause of rising income inequality, under-employment, the decline of low-skilled jobs, etc.–many of the problems that plague the current economy. I get it: those disruptive consequences are real. But they aren’t structural: the state-cartel system is structural, because cartels can buy political protection from competition and disruptive technologies. Just look at all the cartels that have eliminated competition: higher education, defense contractors, Big Pharma–the list is long. The fake-fixes to the structural dominance of cartels and entrenched elites come in two flavors: political reforms that add complexity (oversight, compliance, etc.) but never threaten the insiders’ skims and scams, and monetary policies such as low interest rates and unlimited liquidity that enrich the already-wealthy by funneling whatever gains are being reaped to rentiers rather than to labor. I explain how this neofeudal economy is the inevitable result of our system in my new book Pathfinding our Destiny: Preventing the Final Fall of Our Democratic Republic. Our political system, dependent on campaign contributions and lobbying, is easily influenced to protect and enhance the private gains of corporations and financiers. 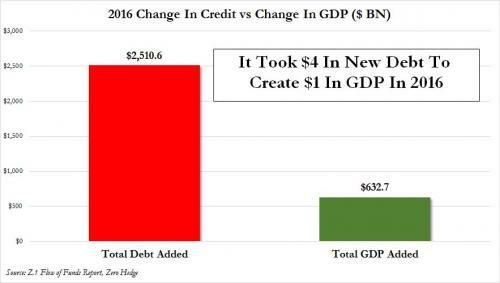 Combine this with the gains reaped by those with access to cheap credit and you have a financial nobility ruling a class of debt-serfs. Cartels and quasi-monopolies eliminate competition by buying start-ups and political protection, raising barriers to entry around their rentier skim. This kills innovation and productivity, which are corralled to serve existing cartels. 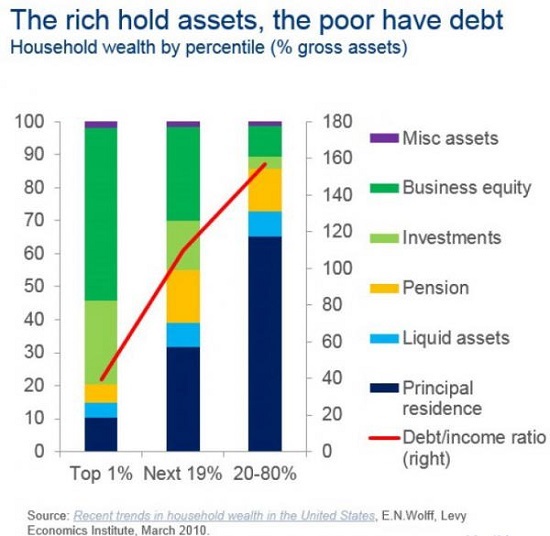 The wealthy own productive assets, the poor own debt. Debt accrues interest which flows to those who own the debt–student loans, auto loans, mortgages, etc. Meanwhile, the highly profitable credit machine is no longer boosting growth:rising interest saps the economy of savings and perverse incentives to borrow vast sums to buy back stocks and other unproductive uses benefit the few at the expense of the economy as a whole. Beneath the bullish narrative of eternal growth and ever-rising profits, the financial system’s buffers have been thinned. 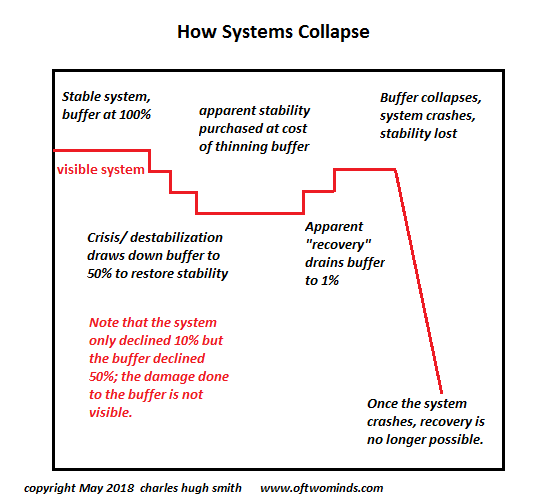 As I explain in my book, the global financial system is now hyper-coherent, meaning that instability in one corner of the system quickly spreads to the entire system. This systemic vulnerability is largely invisible, and so the inevitable contagion will surprise most observers and participants. A funny thing happens in a fast-spreading financial contagion: markets go bidless, meaning there’s no buyers at any price. The entire global financial system rests on this one assumption: markets will always be liquid, but liquidity vanishes in contagions. The fake-fix of the past decade is for central banks to buy impaired assets to create an artificial market. That works if you throw trillions of dollars, yuan, yen and euros into the artificial market, but that process destroys organic markets. Fake fixes don’t fix what’s actually broken. They’re duct tape holding together a broken system. My new book on these topics is available at a 28% discount for the ebook and 23% discount for the print edition through November 30 ($4.95 ebook, $9.95 print). Read the first section for free in PDF format. My new book Pathfinding our Destiny: Preventing the Final Fall of Our Democratic Republic is 23% off ($4.95 ebook, $9.95 print): Read the first section for free in PDF format.